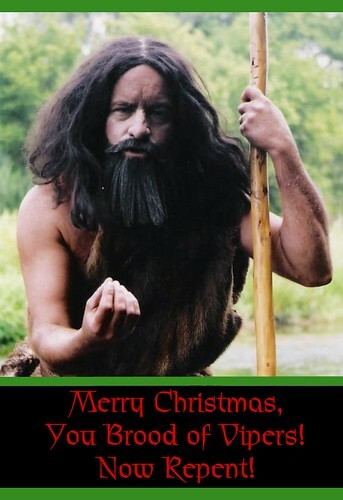 How's This For a Christmas Card? I came across this as I was doing my study on the life of John the Baptist. Wow! The preponderance of scientific evidence for the past 10 years or so has shown that a lot more seems to be built into the natural development of children’s minds than we once thought, including a predisposition to see the natural world as designed and purposeful and that some kind of intelligent being is behind that purpose. . . . If we threw a handful on an island and they raised themselves I think they would believe in God. He went on to note that children are more likely to believe in creationism rather than evolution, regardless of what teachers or parents may teach. I find this rather encouraging that someone in the academic realm has been stating what Christianity has been stating for centuries. I wonder how the other academics will react? I, for one, am delighted. By now, you may have heard of a 34-year-old Long Island Wal-Mart worker who was killed during the blackest of Black Fridays. This breaks my heart for a number of reasons. One, a man lost his life. The fleeting nature of our lives is one thing, but to die in this way is agonizingly brutal. Two, a man lost his life while people were shopping for Christmas presents!! On a day when, like it or not, we honor the birth of Jesus Christ, the Prince of Peace, a man is trampled to death to find toys and products that will eventually wear out or burn out. On a day when we remember the selfless sacrifice of the Son of God gave up His home with His Father in glory to “save His people from their sins” (Matthew 1:21), the loss of life as a result of the selfishness and callousness of consumers simply trying to get a deal is a low point. This is American consumerism at its worst. Three, a man lost his life while people were shopping for Christmas presents, and only a few stopped to check on him. The article notes that this man was gasping for air, yet people walked over him and around him. Four, the way the economy is right now, many toy stores and other department stores are giving Black Friday-like deals and have been for almost a month! This Black Friday business has just turned into a shopping tradition. It’s the thing to do the day after Thanksgiving. If some of these shoppers had been looking in the previous weeks, they would see that getting up at 2 A.M. and working themselves into a consumeristic, frothy frenzy would not be worth it. Fifth, this should be a wake-up call for America. Some of you are saying, “OK, now. You’re overstating things.” Am I? In a culture whose citizenry simply thinks about their own rights, their own conveniences, their own ends-justifies-the-means mentality, more and more events like this will happen. In a world that embraces Darwin’s survival of the fittest, who believe that this world is all there is, with no God to inform and direct their moral and spiritual center, this is the natural and logical outworking of that worldview. In a world where one is defined not by who he or she is but by what he or she owns, we should not be surprised that this happened. May God have mercy on us — and may His people not be caught up in the current of the times. I have set up a Wishlist at Amazon where you can go and directly purchase a book for us. The book will be sent to Boone’s Creek Baptist Church where I pastor. I’m hoping to bring down 35 to pass out to the pastors. Can you help? You can buy them new for $12.23 (plus tax and shipping), but there are also other options where you can buy them used. Yes, I am actually posting. It’s been a long while since I’ve posted–good to be back. On occasion, I am asked to preach a funeral for one who has died without Christ. The first time I encountered this difficulty was actually before I became a pastor. My uncle died as an avowed atheist who had rejected Christ up until the end. He died unexpectedly. I remember my parents telling me how sad and hollow the service was, because he had rejected any notion of the afterlife. For the pastor, a great tension exists. On the one hand, you have grieving family members and friends who want the funeral to be about the deceased’s earthly life. On the other hand, the Scriptures are clear about the reality of their eternal life (or death, as the case may be). How does the minister of the gospel of Christ handle this? Always acknowledge and validate the deceased’s life. This person is someone’s grandfather, grandmother, father, mother, son, daughter, etc. In other words, this person was greatly loved and will be missed. A lifetime of memories are stored on the bookshelves on their minds. A myriad of pictures may be displayed by the casket representing a lifetime of events and experiences. These cannot and should not be denied, even in light of their refusal to receive Christ in this life. Develop a close relationship/friendship with the family of the deceased. Whatever the reason they asked you to do the funeral (such as: you were the only one to visit them at their home or in the hospital; they looked you up in the phone book; you are the pastor of a relative, etc. ), you must take time to get to know the family personally. Visit them in their home, call them, go to the viewing at the funeral home or church. Your presence speaks volumes. You are not to simply arrive and preach your message. You come alongside them and help share their grief and bear their burdens. And you will be amazed at how they appreciate your presence and will lean on you for support. At that point, you are as Christ to them by virtue of your calling into the Gospel ministry. Which leads me to the next point… . Remember your ultimate calling as a minister of the gospel of Christ, even in this situation. In the course of your visits and conversations with the family, you will find yourself tempted to lessen the blow of the deceased’s eternal reality — something which can happen easier that it initially appears. The family is so grieved and despondent that, even in light of the deceased’s apathy or even outright rejection of Christ, may comfort themselves in thinking that the deceased is in “a better place.” The alternative of believing someone they loved so dearly is suffering eternal judgment in hell may be too much to bear. Any other thoughts on this matter? I do not know of anyone who does not want to have a blessed life, do you? And Christians know better than anyone what a blessed life entails. When you know that your life is held tightly in the hand of our Great Shepherd, the Lord Jesus (John 10:27), that is blessing enough! But there is more — so much more! 3:16) begins these incredible collection of Psalms by talking about the ‘blessed man.’ Then, as a father talks to his son, David talks to his children saying, “Before I tell you what a blessed man is, let me inform you as to what he is not.” And he then proceeds in a progression that often snares those who are off the path God has for them. First, a man outside of the blessed life starts walking and may find himself in ‘the counsel of the wicked.’ Soon, he is intrigued by their company and finds himself standing ‘in the way of sinners.’ After a while, he gets so very comfortable in their presence, that he pulls up a seat among the ‘scoffers’ who scoff all things good, all things godly, all things holy. And if we are not careful and living a life of perseverance under the guidance of the Holy Spirit, we may find ourselves getting rather comfortable in the ways of this world and not being holy as God is holy (1 Peter 1:16-17). In A.W. Tozer’s classic and life-changing work, The The Pursuit of God, he noted the role that religious leaders must place in recognizing the need for a hunger and thirst for God. Sound Bible exposition is an imperative must in the Church of the living God. Without it no church can be a New Testament church in any strict meaning of that term. But exposition may be carried on in such a way as to leave the hearers devoid of any true spiritual nourishment whatever. For it is not mere words that nourish the soul, but God Himself, and unless and until the hearers find God in personal experience they are not the better for having heard the truth. The Bible is not an end in itself, but a means to bring men to an intimate and satisfying knowledge of God, that they may enter into Him, that they may delight in His Presence, may taste and know the inner sweetness of the very God Himself in the core and center of their hearts (pp. 8-10). What is interesting is that Tozer wrote this in 1948. What do you think? Is Tozer on to something here? Gotta love the early 1980’s print on his shirt. I just thank God for Keith Green and miss him dreadfully. I wrote this blog entry on March 29, 2006 after God convicted me and my body warned me regarding a particular addiction I have and many pastors have as well. While I have not progressed as well as I would like, reading this 2 1/2 years later helps me to see that work still needs to be done. I’d appreciate your prayers in the matter. I praise God that He gives us the strength to overcome addictions — and he has put me on a path to overcome mine, but I have a long, long way to go. It is really an addiction that began in college and continued on through seminary — right into married life where it all came to bloom. All night study sessions getting ready for the test the next morning. Being locked up in the library. Then getting married and leading an increasingly sedentary lifestyle. Then on top of all that, I have been in the ministry going on 15 years, which allows for an increasingly sedentary lifestyle — on top of that, I’m am in Baptist ministry, which seems to feed my particular addiction more and more because it is just part of our culture. My particular addiction that God is helping me to overcome is that of food. A little history. I graduated from high school weighing a whopping 135 pounds soaking wet. In high school, I actually dropped down to 117 (which was about 25 pounds below what I should have been) because my trust was in my girlfriend at the time rather than in Christ. She didn’t want to eat lunch, so I didn’t eat lunch. Very unhealthy from every angle. But by the time I graduated in 1989, I was 135 and stayed that weight pretty much all through college when I graduated in 1994. During college, I was a music major at Palm Beach Atlantic College. Aside from the jokes that music majors really didn’t do much, nothing could have been further from the truth. One study noted that the three hardest fields of study in academia are law, medicine, and music. I didn’t go into music because of any of that — God called me into the ministry and at that time it was music ministry. At that time, everything seemed to affect me negatively — though it wasn’t necessarily bad in and of itself. But in order to get through, I had to practice on my piano 1.5 to 2 hours per day, plus be involved in a number of extra classes that were required but where we obtained no credit. Plus, I had a couple of extra jobs just to get by. I was busy, busy, busy with bad sleeping habits and addicted at that point to caffeine and pizzas whose establishments delivered into the wee hours of the morning. I stayed skinny, but the pattern was set. Bad habits would develop. Have a hard day at work? Go eat. Need to celebrate? Let’s go eat. Having a fellowship at church? GOTTA EAT! It’s almost as if gluttony is the unspoken, pardonable sin amongst us Baptists. It’s our culture. But in reality, food can be the worst addiction of all. It’s not illegal or necessarily immoral, but it numbs the pain and the hurt and any issue that can go on the in heart. At the beginning of the year, I found myself between 40 and 50 pounds overweight (206). For those with large or even medium frames, 206 is really not bad. But the point is, I have a small frame and was 40-50 pounds overweight. And it really began to affect me. How? (1) Walking up stairs. Walking upstairs from my office to the sanctuary is not a long walk, but I found myself winded slightly. I began to have to time and space out when I would go upstairs. If I walked upstairs and immediately had to talk to someone or preach, I would have to work and labor to catch my breath. As a pastor and preacher, that is not acceptable. (3) The jokes. One friend of mine who lives in another part of the state began joking to me, “You’re beginning to look like a Baptist preacher.” Others come up and pat me on the belly and make comments. And do you know what they would always do afterwards? (4) I began to feel enslaved and doomed to this. Yes, I as a minister of Gospel who preaches about how we can be free from self and free in Christ, would find myself telling my wife, “You know, I really don’t think I can lose weight.” No matter what I tried, I kept gaining. And gaining. But my wife began a program called Lose It For Life by Steven Arterburn. It’s been really good. It’s not like a lot of diet fads. Basically, it’s lots and lots and lots of water. Exercise (and they give you good tips on how to do this in the midst of a busy day), cut down on snacks, and no eating snacks after 8:00. As of March 29, 2006, I am now 191 — I have lost 15 pounds by the grace and glory of God. My goal is 165-168. You may say, “Matt, you have 25 pounds to go!” YES! I do. But knowing that God has set me and is setting me free from my addiction to food and soft drinks now only gives me hope that I can be healthier, it’s also a time of worship that God can truly set one free from anything that enslaves. God must be our all-in-all, but for too many of us, food is. We must preach against this as we do other sins. Stephen Arterburn noted that pastors preach against every other sin — all the while carrying 200 pounds extra weight in the pulpit. We must lay this down as well. I love food — but I love my God more and He must be my ‘comfort food’ as the Bread of Life. I will pray that you all indeed feast on Him and Him alone. Our Treasure The Word Podcast is now up. You can download the mp3 as well or sign-up on iTunes.